Sigvaris 189C Business Casual Knee High Compression Socks Dress Socks CLOSED TOE 15-20 mmHg are latex free Compression Socks made with 88% Nylon and 12% Spandex. Manufactured by Sigvaris, this Business Casual Dress Sock is suitable for professional wear and yet comfortable and stylish. 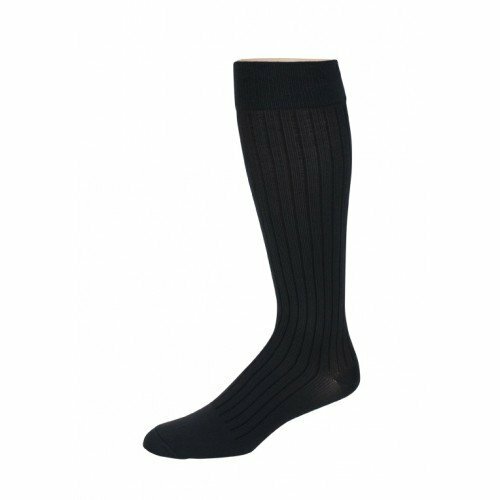 Offering Compression Therapy of 15 to 20 mmHg, the Sigvaris 189C Business Casual Knee High Compression Socks Dress Socks provide graduated compression with pressure decreasing as the sock goes up the leg. A striped pattern gives the Sigvaris Business Casual 189C Dress Socks a modern fashion look and appeal. These Knee High Compression Socks come with a closed toe design. The Sigvaris 189C Business Casual Compression Socks come with a wide top band and two-way stretch, making these dress socks easy to don and keeps the sock up in position throughout a long day. Stretchable toe fabric and a wide heel design combine to create comfort and durability for the Sigvaris 189C Business Casual Socks. Sigvaris 189C Business Casual Knee High Dress Socks Compression Socks come in three colors--black, navy and brown.